As the largest manufacturer of car bows in the United States, we offer wholesale prices on all of our bows to distributors such as auto dealer supply companies, party stores, Christmas decorating companies, and much more. Our bows are a popular item during the holiday season and offer an excellent opportunity for businesses who already work with auto dealers to expand their product line. Minimum orders do apply on wholesale orders. 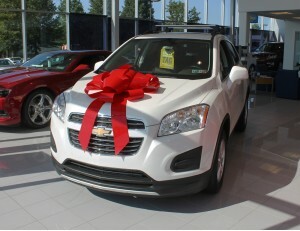 In addition to holiday decor, our bows are used by individuals to top off a special gift, such as a car for a birthday, graduation or anniversary. Companies across the USA and Canada use our bows to decorate for grand openings and create dynamic point of purchase displays. Our prices are extremely competitive. Please contact us for more information. In addition to car bows, we also design and manufacture car flags, swooper flags, wind-free flags, hood covers, and automotive greeting cards to provide a more complete offering for our distributors. We offer the largest inventory of swooper flags, wind-free flags, and car flags on the East Coast and our quality is unmatched.